Kayak World Products is pleased to present the famous Emotion Tandemonium Kayaks. The 13'8" tandem kayak has a 550 lb. weight capacity and seats up to 3 people. This model comes in red and is a sit-on-top (SOT) tandem kayak. It comes with self-bailing scupper holes, luggage handles on both sides, bow and stern toggle handles, an 8' locking hatch, molded-in foot wells, and installed hardware to attach the seats (sold separately). The Emotion Tandemonium is the most stable multi-person kayak ever tested. The center seat position gives this sit-on-top kayak the versatility to be paddled solo or tandem and has room for a third person or pet in the middle, making it the perfect family kayak. The tri-hull design gives the Tandemonium exceptional speed and tracking on flat water for a kayak this size and the up-swept bow will get you through the waves at the beach. The Feeling Tandemonium Kayak is made for unrivaled tandem stability. The Tri-Hull offers this kayak remarkable speed, tracking and flexibility. The sit-on-top layout is user friendly and suits bigger paddlers with convenience and stability. The Tandemonium is equipped with a Large Solace Hatch for saving equipment inside the kayak. Molded foot wells supply multiple areas for comfortable foot bracing in both placements. This steady tandem is a household fave on lakes, slow-moving moving flows and ocean swells. Feeling Kayaks are built in the UNITED STATE making use of residential and import elements. 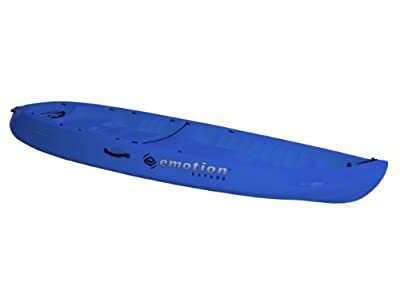 View YouTube Video "Emotion Kayaks Edge™"
View YouTube Video "Emotion Kayaks Sit On Top vs Sit Inside"
View YouTube Video "Emotion Kayaks Comet™ 8"
View YouTube Video "Emotion Kayaks Traverse™"